Action Plan for Roads a huge no. of road accidents in India every day, primarily caused by lack of standardization in the transport systems, undisciplined traffic and poor road conditions. As per the World health organization (W.H.O. )’s report, India tops the nos. in the global fatal accidents since it has the largest no. of 2 wheeler population. Approx. 143,000 people get killed every year in which 66% people are in the age group of 18 – 50. Secondly, more fuel (approx. 14000 million US dollar per year) is being wasted additionally, because of poor infrastructure. In anticipation to minimize the accidents drastically and to save the fuel cost, I have prepared detailed Action Plan for ‘New road and transport of entire India’ which includes innovative ideas and methods of standardization as under. Parking on certain roads will not be permitted to maintain the smooth flow of the traffic and safety. This team will build and maintain parking areas every 1.5/2.0 kms. This team will plan, execute, and maintain all the parking areas on roads. The big question is What type of people will be in IDP departments? The answer is Specialists, businessmen, administrators, technocrats, staff, officers, thinkers, researchers, people with a creative mind and every patriotic person will join an open forum called ‘How to revive India’ Some people will be in IDP Infrastructure Development Plan. 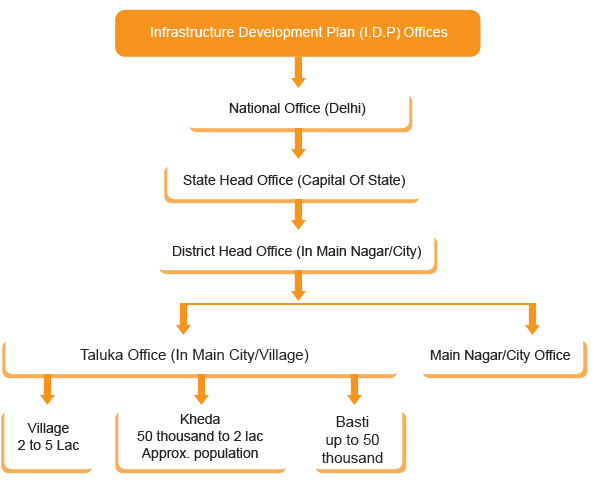 A New Infrastructure Development Planning Department (IDP) in a such fashion it should be settlise in delhi and other branches of the department. According to the classification of the population, there will be one team for every 100,000 population, from each category. For outskirts of cities, each team will cover 50/70 km area depending on the local requirements. Each team will handle designated areas for its scope of work. There will be water and drainage pipes, underground electrical and telecommunication cables etc. As far as possible, all these lines should be under the footpaths. All overhead cables will be at a minimum height of 6.1m from the ground to avoid any interruption. Main aim will be to utilize the existing infrastructure with minor modification to avoid unnecessary expenditure. All the footpath corners should be rounded and chamfered to avoid sharp edges. A minimum of 4.57m wide roads are necessary considering the next 25/30 years (width bigger than this is desirable, however, there are a no. of factors that limits us to this width). We will try to widen smaller roads to 4.57m. Considering the above, outer city roads will be standardized to minimum 3.65m wide one way and 7.32m wide two ways. Road Signals will be mandatory at key junctions and people will be educated to follow the signals without exception. There will be separate red and white signals for the pedestrians. Signals for crossing the roads will be synchronized with the vehicle signals. Durations of these signals will be maintained for safety and comfort considering that a pedestrian can cover appx. 0.6m distance in a second. All the main signals will be operational 365 days without any interruption. We have to publicize all the road details, traffic rules/signs in cities and villages, state/high/express ways to educate the people. Both sides of highways and expressways should be 76.22m free (measured from the centre of the road). It means 152.44m distance will be necessary between the constructions on both sides of the road. For a state-way, the distance should be 61m instead of 76.22m. It means 121.95m distance will be necessary in between the constructions on both sides of the road. For all other roads, the distance should be 45.73m free from the centre of the road. It means 91.46m distance will be necessary in between the constructions of both sides of road. This may be the need of the future since there may be expressways required. If this free width is not available on both sides of the road at present, we have to convince the people gradually about the same and put necessary hoardings on those roads at intervals.